James Louis Garvin – Influential Editor and Journalist. James Garvin was born in Merseyside. His father died at sea when he was 3 and he was raised by his mother. Despite leaving school at 13, he was an avid reader and had read of many literary works including Dickens, Scott, Thackeray, and Plutarch before he was 15. Self-motivated, he also taught himself French and Spanish. His love of Christian chivalry and respect for Louis, the crusading King of France, led him to add Louis to his name – James Louis Garvin. Garvin started work aged 13 as a clerk in a coal exporting firm. At 23 he worked for the Newcastle Daily Chronicle and in 1899 Garvin moved to London to work for the Daily Telegraph as an editor and political writer. He also wrote for the ‘Fortnightly’ under a penname – Calchas. His political prediction of a Russian revolution and the emergence of the USA as a world power were contrary to popular belief. 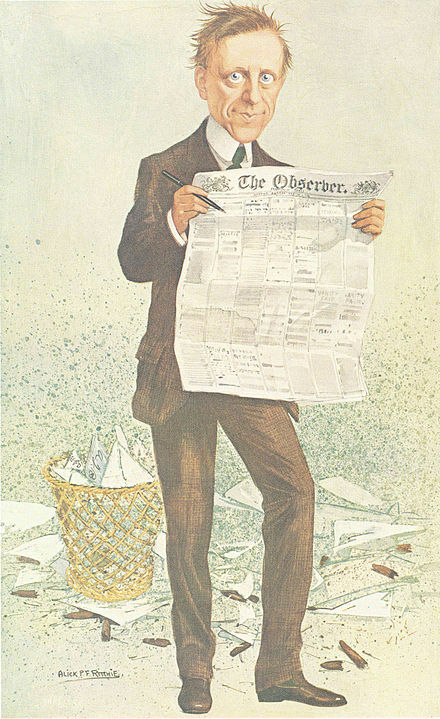 In 1904 he became Editor of the Outlook and in 1908 was appointed Editor of The Observer. He held this job for 34 years gaining a reputation as one of the most influential editors in British history although his most dominant years were pre-1914. He restored The Observer’s reputation and popularity with his vivid political articles and, over time, added sections on arts and leisure creating a quality Sunday newspaper. Garvin married twice, firstly to Christina Ellen Wilson who bore him a son who was killed in WW1, and 4 daughters. Christina died in 1918. The following year he married Viola Woods, the former wife of unionist politician Maurice Woods and moved, in 1921, to Gregories in Beaconsfield, a house set in 7 acres with 2 ponds. Initially, Garvin only visited Beaconsfield on Sundays, preferring to conduct business from London but in 1925, he sold his London residence and worked almost solely from Gregories. Edmund Burkes farm bailiff’s house known as the Shepherd’s Kitchen became his study; a long building by the house was converted into a library for Garvin’s collection of 25,000 books and a granary store housed his collection of encyclopaedias when he became Editor- in-Chief for the Encyclopaedia Britannica. This building was called Piebalds. Visits to London were made once a week to sign documents and attend editorial lunches and secretaries and messengers would travel back and forth between London and Beaconsfield. He had many visitors including Churchill, Waldorf Astor, W B Yeats, and Brendan Bracken. The latter loved the lively chatter and energy of Garvin especially over Sunday lunch and was a frequent visitor. Bracken was introduced to Churchill and Yeats at Gregories. However, Garvin favoured particular politicians such as Chamberlain, Parnell and later Churchill which bought him into conflict with his proprietor Lord Waldorf Astor. Despite mediation, the good relationship enjoyed between Lord Astor and Garvin broke down in 1944 and he was fired from The Observer. Garvin continued to write articles for the Daily Express and then the Daily Telegraph and his last article was written a week before his death. 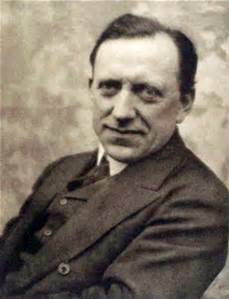 He died aged 78 on January 23rd 1947 in his study at Gregories. Garvin Avenue is named after him. He donated books to the Beaconsfield library in the memory of his son which formed the basis of the World Classic Collection. Gregories was bought by the publisher Walter Hutchinson with a view to turning it into a museum to commemorate the great editor. However, Hutchinson died before this could happen and the house was divided into two; all Garvin’s books were sold and the outbuildings, library and garden were developed into housing. References and Further reading: ‘About Garvin’ by Alfred M Gollin; ‘Garvin of the Observer’ by David Ayerst.